If you want to sell your home quickly — and for the most profit — you can’t just list it and cross your fingers. Successful sales are well-planned sales, and there are several ways in which you can make sure your own home sale turns out as you’d like it to. What kind of people are buying homes in your area? Is your neighborhood popular among new families, retirees, young singles? Do a little research to see what type of buyers are typically attracted to the area, and figure out how your home caters to their lifestyle. Marketing is one of the most important aspects when it comes to a successful home sale, and knowing who to target is the first step. Once you have learned a bit about your potential buyers and what they’re looking for, use that information to guide the rest of your sale preparations. Consider what you’ve learned about their wants and needs and carry that into any renovations you do, your listing, and your open houses. Make your home one that your buyers really want to live, and you just might find yourself in the midst of a bidding war! When you sell your home without enlisting in the help of a professional, you open the door for significant mistakes to be made. Real estate professionals have the expert knowledge and experience that is needed to steer your home sale towards the best possible outcome. They can offer advice on listing price, marketing materials, open houses, offers received, and can take care of paperwork. Attempting to do everything yourself may sound feasible, but you could sell yourself short by accidentally pricing your home too low, or you may be on the market forever if you price it too high. Mistakes in contractual paperwork could land you in hot water, and overall you’re more likely to experience stress during your home sale if you try to do it all yourself. Find a real estate agent that you’re comfortable with, and you’ll be more likely to get what your home is worth without the extra stress. Making sure that key renovations are up-to-date before selling your home is another crucial factor if you want to sell it quickly and profitably. Important things to consider include your kitchen, bathrooms, and roof, as buyers tend to scrutinize those areas the most during a walk-through. Make sure that everything is in good condition and looks presentable before listing — you don’t want potential buyers to see any red flags when looking at your property. Ready to sell your home? Contact John Kavaller today to make the most of your sale. When it comes time to choose the price you ask for your house, I strongly encourage you to give this some serious thought. Our studies show that a house priced correctly at the onset of the initial marketing plan will, on average, yield 6% to 8% more for the seller than one in which the seller prices high and then reduces until it sells. There are many reasons (we believe) that the seller will eventually get less, but it usually comes down to a combination of a few key factors, fear and greed. We advise our house selling customers that fear and greed rule the housing market (just as they do in every other market). Both the seller and the buyer(s) must deal with both of these emotional forces that can wreak havoc on a house sale. For the seller, there is no fear when they first enter the market. They want to get above top dollar and they certainly are not willing to give the house away. They often do not understand that greed will cause them to over-price their house, asking an amount that will lure the WRONG buyers to their house. As time goes on and their house does not sell, greed is replaced by fear which can cause them to capitulate to an offer that is lower than what their house is worth. If you think this cannot happen to you, you are like all the seller’s who sold below market when fatigue set in after months or years of being on the market without a buyer. For the buyer, greed will cause them to low-ball a well-priced house. Most new-to-the-current-market buyers want to try to buy a house at far below market value, a form of greed that often causes them to lose in a negotiation war to another buyer (or to receive a counter offer from the seller that is far higher than the seller is willing to take). As time progresses and they tire of the difficulty of house shopping and the consistent losses in negotiation, it is fear that causes the buyer to bid too high on a house they could have bought for less. If you think this cannot happen to you, you are like the scores of buyers who work with the wrong agent and who look at the wrong houses, and then fail to make compelling offers. So the new seller and the new buyer, unless well-educated by their real estate agent, typically allow fear and greed to bring them harm. Smart house sellers recognize how the market runs. They use their initial asking price to activate the fear emotion of the ready-buyers for their houses. If you understand this concept, then you understand why we advise house sellers to get top dollar for their house, they need to plan to sell a house in just 4 to 14 days. Take a look at the image on the right. Can you tell which circle does not belong in the picture? Pretty tough, huh? Four of the five circles are a shade of blue, one is yellow. Four of the five are the same relative size, one is quite smaller. So if you chose the small yellow circle, you are correct. Now look at the image on the left below. Can you tell which one doesn’t belong? You know what? So can every buyer who will look at these houses online when it comes time to select properties to visit. 94% of the prospective buyers for your house are using the internet to select which houses to visit, and they aren’t stupid. Buyers are not going to choose to come see your house if it does not compare favorably with those priced similarly. When you over-price your house, even by “just a little,” you make buyers compare your house to those that are nicer. In my 24 years of experience, buyers prefer the nicer houses. Next time you get the urge to “price it high and see if somebody brings an offer,” please try to remember these pictures. It is how the internet works for buyers, and buyers are using the internet. So how does this relate to fear and greed? For most areas and price ranges, there is one or more buyers waiting in the wings, looking at every deal that hits the market in their chosen neighborhood. They understand values better than most Realtors (for their selected neighborhood), and they are ready to jump when the next one hits the market. (If you want to know more about who’s stalking your neighborhood, just follow the link). So why are they ready to pounce? Because they are seasoned buyers, and they already lost one or more in your neighborhood when “greed” was in control. But they are tired of losing out, and they want a good house. If you price your house to sell, it will look like the middle house in the picture on the right. Your house will be the obvious best-buy, and buyers will jump on it and make a full-price offer or higher. Why? They are fearful of losing your house to another buyer. But if you hit the market over-priced, they know you won’t sell right away, so they are in no hurry to bring an offer (or even look at your house that compares poorly to the good ones priced at the same level). Fear and greed are great emotional motivators, make sure you put yourself in a position to use them to your advantage. Want to know other ways to get top dollar for your house when you sell? Simply drop me a note and we’ll set a time to discuss the best ways of selling your house. An interesting phenomenon often arises when one person or family decides to sell a property and purchase another one. The situation occurs because just about everyone wants to sell high and buy low. This idea is ingrained in the business thought process. Realistically, however, objective measures bear out the fact your property is worth what the current comparables indicate. 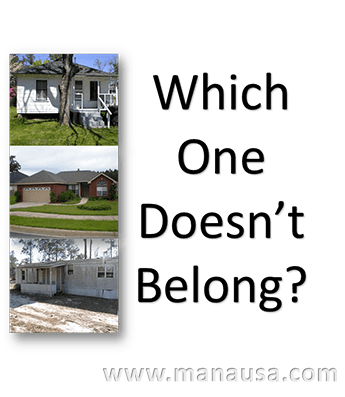 What are similar properties in your area selling for? That is the gold standard of professional pricing with adjustments being taken into account for the individual characteristics that may be present in a specific property. I’ve worked with folks who insist their property is more valuable than the one across the street. For all kinds of reasons, the potential seller elevates his own property above the available comparable properties in an attempt to justify a higher pricing model. When buyers choose a home based on purely financial considerations, it’s a business deal. When buyer’s purchase because the property calls to them emotionally, the decision is driven by more than what’s the lowest price of purchase. Compromises on the buyer and seller side must be made if a real estate transaction is to be closed. A potential buyer should not expect to purchase a legitimately priced home for ½ the asking price. Comparables need to be considered in order to arrive at a reasonable first offer. Going over a laundry list of perceived negatives will simply drive the seller away from making a deal. A good real estate agent will price a property appropriately. The negatives on a buyer’s list will already be known and accounted for in the listing price. In hot markets, a seller will not give a low ball offer the time of day. In slower markets, unless the owner is close to foreclosure, the buyer gets a very cold shoulder. In order to maximize your chances of buying and selling successfully, use comparables for both your selling price and maximum purchase price. High balling the sales price and low balling your buying price is a formula sure to lengthen your selling and buying time line. Contact me today for realistic pricing opinion and realistic purchase pricing. While the real estate market in most areas may slow down considerably during the winter months, activity quickly picks up in the spring time. More listings are available for buyers to choose from, but there are typically many more buyers competing for those properties. With the fast-paced and often pressure-filled market activity during the spring, it is easy for buyers to react accordingly and to overpay for the home they fall in love with. By following a few important tips, you can take steps to ensure you get a great deal on your real estate purchase. There are many reasons why buyers may overpay during the spring months, and these range from the feeling that they must act quickly to make an offer on a property they love to the belief that they need to offer the asking price even if they feel the price is too high. Some may even be involved in a bidding war with another buyer, and they may structure an offer based on emotion rather than on sound real estate fundamentals. While you may need to move quickly during the spring months, you also should avoid making impulsive, emotional decisions. Spending a little time researching the property and structuring an intelligent offer will generally not kill a deal. All home buyers regardless of the season should create a firm budget. This should include a personal monthly budget so that they can determine what home ownership costs are affordable for them, and it should also include a buying budget that accounts for a down payment and closing costs. Keep a trained eye on this budget, and do not deviate from it. When you fall in love with a property and envision your family living in the space for years, it is easy to develop an emotional attachment to it. While you may be excited about a property, you also should be willing to walk away if the transaction becomes too costly for you through negotiations and counter offers. Remember that there are many other properties on the market to choose from that may be more affordable for you. Seeking representation from John Kavaller, a skilled real estate broker and Realtor® is an important step to take when buying a home. John will help you to define your goals and to remain true to them, reminding you of your needs and specifications as well as your budget for your purchase. If you are ready to start looking for a property to purchase, seek assistance a broker who knows it’s your money on the table and will protect it.